This JennSwing swing frame is a heavy duty accessible single swing set that’s perfect for a single child ADA user. 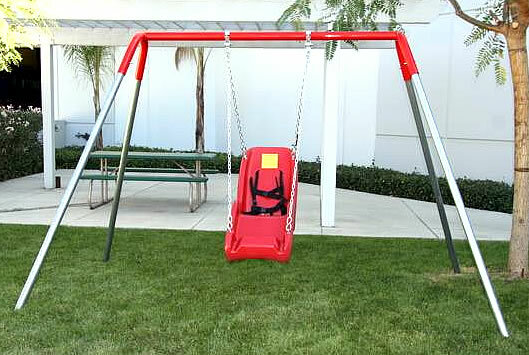 This special swing provides extra support and comfort for children. The safety harness keeps the child secured tightly so no harm can come to them. The frame measures 8’2″ long and 6’6″ high. The frame is made from tough steel tubing; the horizontal bar measures 2-3/8″ outer diameter, and the legs measure 2″ outer diameter. The end frame fittings and top rails are powder coated, and they’re available in red or green. This structure is built for outdoor use, but with the optional feet, you can place the swing indoors or on patios without marring the floors. If you need another height, different heights are available upon request. Note: The structure comes with swing hangers (which clamp to the horizontal bar), but both the chains and the swing seat are sold separately (please see below). Call us with questions about the ADA Child Swing Structure, TOLL FREE.